Take a right turn to Ice Station Zero | Watts Up With That? In three days, the slope of the Arctic extent graph will begin to drop off. Anyone who doubts the correctness of the PIPS based methodology I have been using, should take a look for themselves. The modified NSIDC map below shows ice loss since the first of the month in red. Where’s Waldo? The decline in the slope of the area graph is even more dramatic. Area is a better indicator of melt, because it is not affected as much by wind shifting the ice around. The graph below of average ice thickness shows that 2010 is starting to follow a path more like 2006 than 2007. In 2006 the ice thinned vertically, but did not compress much horizontally. In 2007 the winds compressed the ice horizontally, which led to lots of incorrect news coverage (to this day) that the Arctic was having a meltdown. The average ice thickness actually increased through the summer of 2007. The video below shows how the winds have changed since earlier in the summer. The ice is no longer being compressed inwards, it is now being stretched outwards by cold northerly winds. The NCEP forecast for the next two weeks is shown below. Temperatures generally running well below normal in the Arctic. Note – I color shifted the images and scale to make them easier to differentiate. This does not change their data in any way, it just makes it easier to understand. Temperatures in the high Arctic have been below normal this summer, and in a few days will start their decline towards winter. In 50 days, they will drop below freezing, and remain there. Meltwater ponds at the North Pole are starting to freeze over. This is the same point I raised questioning PIOMAS back in April. The computer model is predicting that 3+ year old ice (which is probably in excess of 10 feet thick) is going to melt by early August. That seems rather far fetched. Below is an overlay of the NSIDC map and the U of W simulation for August 18. Note all the multi-year ice that needs to melt. Like myself, Julienne has forecast 5.5 million km² for the summer minimum. Not everyone at NSIDC agrees. Mark Serreze has been quoted as predicting a possible record low, like he does almost every year. Mark Serreze of the center forecast the ice decline this year would even break 2007’s record. Conclusion : There is nothing going on in the Arctic which hints of a repeat of 2007, other than the highly suspect PIOMAS graph. Seeing as 2010 shows, by satellite, the best ice concentration in the Arctic basin in the history of mankind (or satellite era, whichever…), and the arctic air temp is running at or below normal according to DMI, is it unreasonable to anticipate that barring a wind pattern similar to 2007 that this year could have the highest summer extent in the history of mankind (or the satellite era, whichever….) ???? Oh, and my on-line nemesis on another forum has latched on the PIOMAS graph like a rotweiler on crack…. Now that Phil Jones has got his super new job (no doubt excellently paid and with a fine index – linked pension), perhaps the UEA might prise him away from his computer screen (not to mention his email account!) and give him a thermometer and a tape measure and parachute him into the North Pole! After a good spell of gardening leave, a bit of REAL scientific investigation and measurement would surely do him a world of good! It would also keep him out of mischief until Prince Chuckles has sorted out his richly deserved knighthood! Who is “Wilson” from that bar graph. Whoever he works for needs to fire him! I laugh when people predict total meltdown within the next couple of years. If the ice is still there in a couple of years time then Gore et al will have some explaining to do. People like Serreze seem not to understand the work they do despite it being their job to understand. Steve, I would only add what I wrote in my previous post that if we take the ice extent as it is today and project out in the future using average rates of ice loss for July and August, which are -84,980 and -53,290 sq-km per day, respectively, based on averages from 1979-2000, we would end up with a minimum of 4.8 million sq-km. Using rates of decline from 2006 we would end up with a minimum around 5.3 million sq-km, and 2007 would yield a value below 4 million sq-km. Where’s R. Gates when you need him most? isn’t this a left turn ? I’ve already applauded you for your correct forecast in the slowdown of melt, but certainly I have no problem doing so again…nice job. I still do sense you reaching (or almost hoping) that the melt season would just end as quickly as possible, so that you and your skeptical friends could somehow claim that the Arctic Sea ice is recovering. You seem to hold on every little wiggle in the graphs, hoping some little bit of data might help you prove that the Arctic is returning to normal and that this would somehow be a final nail in the coffin of the AGW hypothesis, much like you did back in March when strong (negative AO index created) NE winds whipped down across the Bering Sea and created some late season thin ice that created the much bally-hooed “bump up”, which of course has just as quickly melted away. Again, I applaud you for the short-term call in forecasting that the 2010 melt would slow and begin to parallel 2006, but I think it is short-sighted to think that this is going to continue for the rest of July and August. On your post about “Concentration” I’ve posted links to plenty of data that shows warm water and warm air and a potent DA setting up later in July and into August. You seem to ignore that little beast called the Arctic Dipole Anomaly, which is just one reason why I am still more than comfortable with my 4.5 million sq. km. sea ice minimum forecast, though you’ve politely told me to forget it. Actual measurements versus model simulations. The North goes down and the South goes up. Only the models show catastrophe looming. The measurements are mostly reassuring. In 2008, the same technique was used by NSIDC to forecast a 3.59 minimum. Am I reading that NCEP two week forecast map correct? It appears that some peripheral areas are showing ice gain forecasted already. Makes sense to me from what I have deciphered using some other analysis lately. I just thought the re-freezing would occur more from the center outward generally and not from the edges in. Is that normal or just somewhat of a fluke for this year? Someone hinted here yesterday that Wilson occasionally posts comments on these threads.. I never really viewed this as a contest, but I am still more than comfortable with my 4.5 million sq. km. sea ice minimum forecast. Interesting though that AGW skeptics see this as a contest. I suppose then that if my forecast turns out to be right or closer, Steve will just say that it was all “the variability of the wind” and move on, even though the Dipole Anomaly is all about the wind that seem to be generated from anomalous temperatures that create anomalous winds that create anomalous temperatures, and so forth, like all chaotic attractors do. there is no evidence of your “long term down trend”, as we have only data of one downward half of a natural cycle. Only if you subtract the half cosine from the 1979ff data, (what nobody really can do), there may be something left or not. I love your work! One thing that continuously bothers me is why NO ONE does a map of “atmospheric energy” around the globe. GRANTED it would take a fair amount of processing, and you have to have the moisture level and temperatures a say, 0 to 50,000 feet to do a good job. But I’ve had a little thesis for some time: ATMOSPHERIC ENERGY REMAINS RELATIVELY CONSTANT. THUS, when you have, say, a couple of heat waves in the USA…that energy excess is balanced by, say, an energy (and possible comensurate temperature drop) elsewhere, say North Pole, and perhaps SOUTH. Of course this might be non-sequitor to your work and interests, but I’m not beyond “planting seeds”. You know, Gates, regarding hollow compliments, eventually you might have to stop praising Steve for his short-term analysis being spot on, especially after a couple years of that. And I mean to say that you might have to change your oft repeated second half of your post regarding long term trends. If you pile up enough short term accurate assessments of continued ice health, it becomes a long term trend of continued ice health. And surely you jest about ice being able to suddenly bounce back to some predetermined (by whom?) level of ice indicating rebound. Are you saying that it must do that in order to show rebound or are you willing to consider a slower return to previous levels? Other measures, for example El Nino measures, use a much better analysis of data to suggest pending conditions and that purposely shy away from linear statistics, as these have proven to be poor predictors of possible pending changes in oscillating systems. And would you agree that the cryosphere is an oscillating system? The NCEP map animation is a temperature anomaly forecast. according to a recent press release from the the University Corporation for Atmospheric Research (UCAR), the thermosphere has experienced a tenfold decline in temperature since 2002. You are guessing what Steve’s reaction will be (if he is wrong) , but earlier provided us some insight to what your reaction WILL be if you are wrong. I find two things in that post, humor and you having some doubt about your prediction. That is all. We all shall find out soon enough. And yes I view it as a contest, but only because of the way you post and how you respond to all of Steve’s posts. You sure have not mentioned PIOMAS very much lately, I find that humerous as well, because you used to mention it in every other comment you made!!! Steve, I have to admit I made a mistake in 2008. I wasn’t aware that the ice age data I was working with uses a 30% ice concentration threshold instead of a 15% threshold. I had incorrectly assumed that a 15% cutoff was used as it’s a standard used by many of us in the sea ice community. But the ice tracking algorithm apparently needs to use a higher threshold to keep track of the sea ice. Thus, my prediction in 2008 was for ice extent using a 30% cutoff, which is quite a bit less than an extent using a 15% cutoff. It seems the average for 79-09 was about 25 million km^3 of ice. Where is there an anomoly? Further; at current levels, we’re at 18.6 (7.75M km^2 x 2.4), vs an average (again this is just from eyeballing their graph) of 19. There doesn’t appear to be an anomaly at all, unless I’m doing my math wrong. Can anybody either tell me what’s wrong with my math or what they’re using for data and why it’s so different than what PIPS and AMSR-E appear to show. OK, I see the ‘ANOM’, rather blurred, went right by without my reading glasses. But same question. If the anomaly is minus around the edges, compared to the center at the pole, will the tributaries tend to re-freeze first, whenever, as the minimum approaches? I could see that since deep currents would affect them less (but, the latitude is also less). I haven’t been following this sea ice for multiple years so I have nothing upstairs on that matter. Thought you might remember from years past. Gates, of course it’s a contest. Ever read biographies on scientists? Candace Pert has an excellent one out called “Molecules of Emotion”. Its pages are filled with the heady experience of competition among scientific circles. It reads like a “whodunit”. And while this is just my hobby, I take it seriously. Funny thing though, history is filled with the discoveries, wise council, and spot on understanding of our world attributed to hobbyists. I have confirmed that Steven Goddard’s ROI (Region Of Interest) has never been defined or explained anywhere on WUWT to date. I have confirmed that PIPS 2.0 is meant to be used for navigation purposes only, and should not be used to make quantitative measurements of ice volume, as these will lead to extremely high biased volume estimates, given the conservative nature of thickness values, who’s sole purpose is to provide for safe transiting of submarines under said ice. We’ve now reached to point in the season where the trends start to diverge. Up to this point guessing where the extent will wind up based on the trends up to this time of year is exactly that, a guess. “Meltwater ponds at the North Pole are starting to freeze over. Or was it just snow filling it up? Here’s photo’s from the day before, that day when it snowed on the cherry picked 6th and the day after that, all from the other camera. Meltwater ponds do not start to freeze up in July, they get filled with snow that is all which quickly melts and then gets filled again till later in the year when they do refreeze over. If you want to pack some punch with the big things, then don’t look silly with the little things. I can confirm that PIPS 2 has been underestimating ice concentration in its forecasts. Sorry to jump in, that’s exactly why I kept harping on the “cutoff percentage” in past posts Julienne. This creates a rather ‘black hole’ in the maps and logic being applied by various data entities in this area of science. Especially when you bring in the aspects of wind reversals, as you have mentioned, this could end up being sizable. As long as the wind is pressing the ice against the edges, basically no affect occurs, however, when reversed, fragmented ice is blown out of the “cutoff” iso-lines. The ice is still there, it’s just suddenly no longer counted. In some aspects this could be seen as correct with caveats, on other aspects, this is incorrect and deems the data unusable. Why is it so hard to just get the real ‘total’ sea ice data on a per cell basis? Who ever then used the data could form their own ‘cutoff’ point if it was deemed necessary. I can find no current data available, only historic up to 2008. Some like me like to do the science, to understand and try to stay out of the way unless there should occur something that seems to add to the understanding, I just wish the data was more available in this area. That’s quite a claim. I’ll believe it only when I hear from Lewis Pugh, the kayaker… I wonder if he’s set off yet? You are wrong to clump all skeptics together in thinking we wish for Snowball Earth to prove AGW wrong. Nobody is prepared for that, as most govt’s have been listening to the steady drip, drip, drip of Catastrophic Meltdown Doom. If the Earth is to cool a lot, I hope that it does so slow enough that mankind can adapt, and have enough time to throw off the oppressive yoke of the Anthropogenic Warming Guilt Trip. We’ve much better things to be doing. Wayne, the 15% threshold as applied to passive microwave-derived ice extents came from comparison studies of the ice edge from passive microwave at 25km spatial resolution with higher resolution data from higher resolution visible data (i.e. AVHRR) and also radar (SAR) data. So it is not “Dropping. Like.A.Rock” anymore? Of course trending a straigh line down and saying “The End is Nigh” is not science. We know there are cycles. So the question is ; Have we reach the bottom of this cycle? And, unfortunately, also hard for those who has a hard time with the electricity bill already. But who cares about them? Not the CAGW crowd, thats for sure. 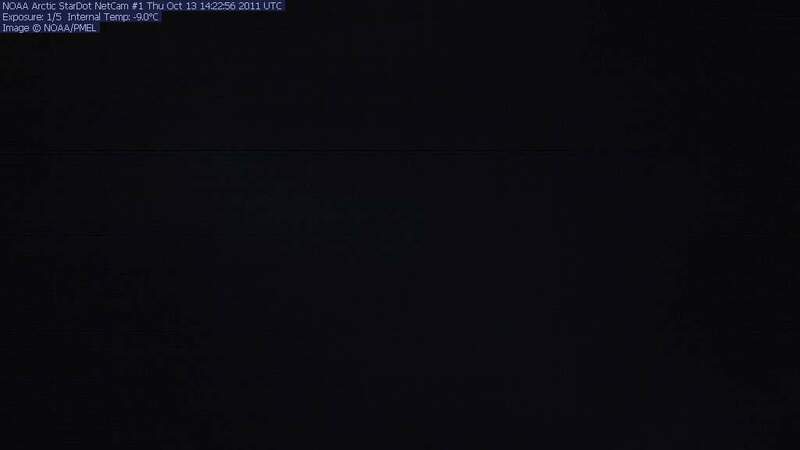 The pictures you show are from the other webcam. The instruments near the one Goddard was talking about show it below freezing and very cloudy for 15 straight hours. Why wouldn’t the ponds freeze? Thank you Pamela, I think that is the “skeptic” point of view in a nut shell. Climate is an oscillating system with known cycles. – one with a period of about 88 years and the second with a period of about 200 years. not to mention all the long term Milankovitch cycles. Also identified are other 50-70 years fluctuations. Nature just does not move in straight lines very often. My praise of Steve is not hollow. I’ve called him brilliant on many occasions, and meant it, but I also think he uses that brilliance to carefully pick his cherries to prove his skeptical case against AGW. I’ve only been on WUWT for far less than a year, so if Steve’s forecasts continue to prove accurate in the long term, then he shall gain more and more of my appreciation for his skill. When he et. al were crowing about the March-April “bump up”, and I cautioned that what goes up that fast in Arctic ice late in the season, would also come down just as fast, and when it did come crashing back I don’t recall him giving me any credit, but instead, he shifted over to his PIPS 2.0 thickness data, and lord knows, we all got pretty PIP’d out over that. The level of rebound in Arctic to necessary to consider it a true recovery is something I’ve brought up many times. 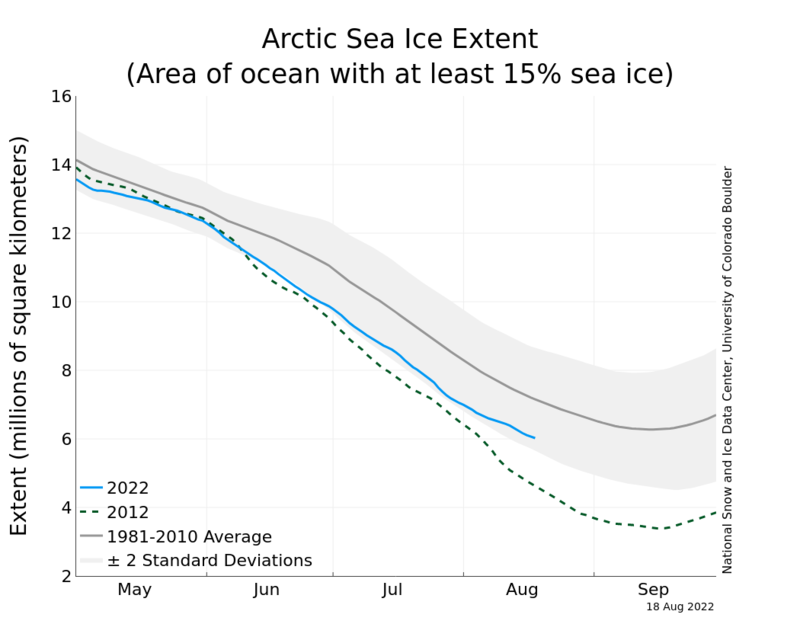 Arctic sea ice is in a long term decline, and has been for decades. Julienne’s excellent graph, referenced in my last post displays that quite well. 2007 was a shocker for everyone. 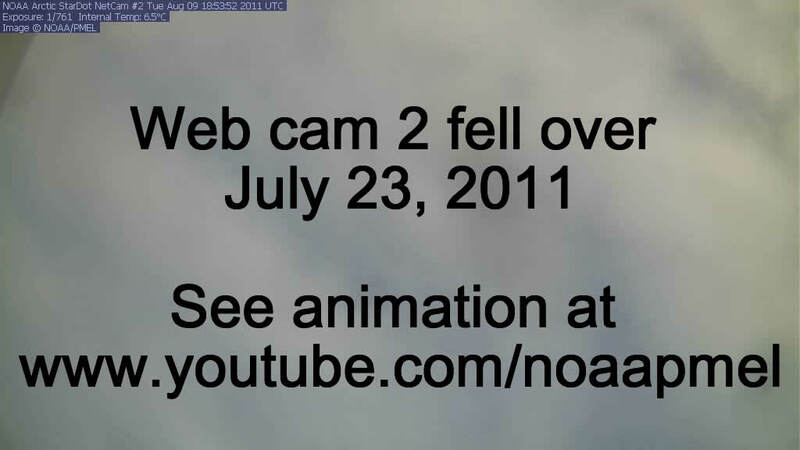 No GCM’ predicted it, nor could they as it was the result of anomalous meridonal winds (aka the Arctic Dipole Anomaly). This anomaly, which has been growing in frequency and intensity for a decade or more first started appearing with more regularity about the time that the actual Arctic Sea ice extent started diverging from the GCM’s. This shift in the rate of melt in the Arctic is exactly what would be predicted by a chaotic system that has reached some sort of tipping point and is suddenly found a new attractor. Chaotic, unpredictable, and completely deterministic. So back to the point of what a “recovery” would mean. If you look at the long term summer minimum, (from Julienne’s chart) you’ll see that a true long term recovery back to a point that we are not seeing a long term decline would put us somewhere around 7 or 8 million sq. km. for the summer minimum. 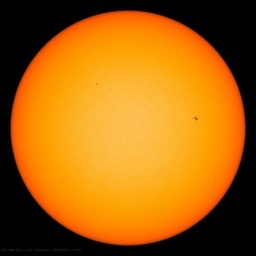 We could certainly build back up to that, maybe going to it over a period of a few years, and I would think that would be what AGW skeptics are looking for…and being a 25% skeptic, it would be what I would be looking for. On the other side of the coin, I’ve said since March that the minimum would be somewhere between 2008’s low and 2007’s low, which put’s it about 4.5 million sq. km. this year. My long term forecast shows the DA intensifying it’s grip on the Arctic, as it goes from an anomaly to a regular feature (it’s getting very close now). And yes, the Arctic is an oscillating system, with short, long, and medium term variations, (these are really oscillating chaotic attractors) but I happen to think that the 30% increase in CO2 added since the industrial revolution is significant enough to disrupt these natural variations, and the Dipole anomaly is one example of a new oscillating chaotic attractor being added to disrupt the other patterns. Such is the nature of a chaotic system. And as CO2 continues to increase, there is bound to be other chaotic attractors besides the DA that will arise, with some final new equilibrium point (which can be a final set of oscillating chaotic attractors) not to be found until the growth in CO2 ceases. Andy, why is it “going to far” indicating that some pond on the pole is frozen? So when air temp is below zero it freeze, and above, it melts? So another day its melted? up-down-up-down….soon it will be down,down down. Is it that important to you? Why? Your communication style is remarkably abrasive. When temperatures get below freezing, water freezes. You can see a layer of thin ice on the surface of the melt ponds. Also, frost often forms on the ground even when the air temperature above is several degrees above freezing. That jives with the height of the atmosphere contracting. Proverbs 16:17-19 New International Version. In regards to the N. Pole web cams and the freezing over of the melt ponds– this is a short lived event– essentially Steve’s talking about “the weather”. Wait a few days and I’m pretty certain we’ll soon see some sunny days on those web cams with the sparkly water of the melt ponds reflecting in the July sun. Villabolo, why should we listen to you quoting the “wisdom” of Palestinian peasants several thousand years ago? You ought not to go below the intellectual level of “Mein Kampf” as your sources! Fair enough if your talking about a full recovery but a little unreasonable if were discussing what constitutes a clear trend towards recovery. I would say a return to a summer minimum in excess of 6 million sq km for several consecutive years would be indicative of a clear trend towards recovery. Particularly in light of the consistently downward trend. I also find it perplexing that we had a result in 2007 that was so much worse than the “models” forecast and this does not appear to have had any consequences in the years that followed. I quoted that Bible verse in the same way I would quote Santayana. If it’s appropriate, quote it. You, however, seem to have an ANTI-SEMITIC character whose fuse was blown by a trivial quotation from ancient HEBREW literature. Why should I listen to you? What concern is it of yours my friendly conversation with R.Gates? Seriously, I’m not interested in your “advice”. Mr. Davidson believes the LA NINA brings sunny Skies. Thus the ultimate Bad is a Strong El Nino & a quick transition as changes in the AIR, take less time to reach the Arctic than warm Ocean currents at their measely 3 knots. Thus 2007 = warm + Clear at the same time, because the Clearing came fast and the Warming, though created first, was Slow . (Or, remember: the East Coast last Winter: El Nino humid Air dumped into LaNina storms still moving up the east Coast = Super Snows – – so combined affects are common ). Now as the La Nina (cold) is following LATER than in 2007 we can expect cloudy skies UNTIL it catches up. 2010–6 -.83 -1.12 -1.34 POWERFUL La NINA ! with the rest of the report showing EVERY Nino area & over 2/3rds of the Equator is below norm..– but the New Rules require 5 months before declaring a La Nina. Their “ensemble” prediction has it crossing the critical -.5 mark on JUNE 1st. However if the lag to the Arctic Skies is two months, it may not Clear till August. It would still kill the Ice, but not overheat the water = Reverse the currents = 300 mph Storms. July 5-6 ___ – 93,125 _____- 33,740 … 2010 is only 151,406 ahead. All 4 Norsex indexes now show 2007 ahead but Jaxa or Bremen AMSR-E, or NSIDC (barely). PS: an ANOMALY means the DIFFERENCE FROM NORM. As almost everyone uses a slightly base of years to get their “Norm” – – read the fine Print CAREFULLY. If by consequences, you mean the Arctic sea ice disappearing completely by 2013? You are right, why did we have the big drop in 2007 and then a leveling off (hardly a recovery, statistically speaking) in 2008 & 2009, but not follow on drops on 2008 & 2009? I must go back to chaos theory for this, and assume that we have a combination or group of chaotic oscillating attractors, that each are tugging at the Arctic in different ways. I find it most remarkable actually, that considering the depth and length of the solar minimum, that we did not see a more robust recovery. We saw very low total solar irradiance and very high GCR’s for an extended period in 2008-2009, as well as a La Nina, and in looking only at those, one would have thought that both those would provide even more of a lift to the Arctic sea ice. And I hate to keep “harping” on this, but the new chaotic attractor on the block in the Arctic is the Dipole Anomaly, which many experts would simply call “polar amplification” or positive feedback. They are correct, but I prefer to look at it more from a chaos theory standpoint, as I think it may set the stage for what could be ahead in the Arctic, and helps me to understand why the system didn’t spiral down more after 2007. In essence, we have competing chaotic attractors, each tugging the Arctic in directions that are often quite opposite. With the solar minimum well passed us (yes, Virginia, we will have a Solar Max in 2013), and GCR’s decreasing and total solar irradiance increasing (though sluggishly), we are going to see these oscillating chaotic attractors become more entrained (as opposed to competing with) the Arctic Dipole Anomaly between now and 2013. Hence, while I haven’t forecast a new low this summer in sea ice (4.5 million sq. km) it will be lower than 2008 or 2009, as we have not quite pulled away from the lingering effects of the solar minimum or increased GCR’s. But I do see a new record (or several in a row) as total solar irradiance aligns more with the strengthening DA to send seasonal Arctic sea ice down to the 2.0 million sq. km. range by 2015. David, climate models do show events like what happened in 2007. And sometimes they show a recovery for a few years afterwards, and sometimes not. The NCAR CCSM3 climate model performs best overall relative to the observational record, and this model shows evidence of rapid transitions towards a seasonally ice-free Arctic state under increased levels of atmospheric GHGs. The difference in the observed September ice extent between 2006 and 2007 was 1.59 million sq-km which is a similar order of magnitude of some of the ensemble runs from CCSM3 before such an abrupt transition occurs. But some of the model runs also indicate a recovery for a few or more years after a large drop, followed again by a more gradual decline. In the models you can interpret it like this, sometimes natural variability is “in phase” with the forced change and dramatic ice loss occurs which can be further enhanced by natural feedback processes, and sometimes natural variability is “out of phase” with the forced change and a temporary recovery may occur. But eventually the natural variability will once again be in phase with the forced change and large ice loss will once again occur. When I look at what happened in 2007, I view it in that context. A thinning ice cover over the last few decades allowed the ice pack to be very vulnerable to forcing by an atmospheric/oceanic pattern conducive to ice loss. 2007 was not unique in terms of its atmospheric and oceanic forcing, but when you had thicker ice, you didn’t get such a large drop in ice extent since the ice was still thick enough to survive (even though volume loss was equivalent). But in a thinner ice regime, it’s not, and large drops in ice extent can occur. I would point out though that in climate model simulations, there is no evidence of a tipping point, no value of ice thickness or ice concentration or ice extent that you have to reach before a rapid transition towards a seasonally ice-free Arctic state occurs. The only thing that appears obvious, is that the ice needs to be thin enough so that it cannot survive an anomalous atmospheric or oceanic forcing. When I compared ICESat derived ice thickness fields from March 2007 with those in CCSM3 before abrupt transitions occurred, the thickness fields were about the same. …..I also find it perplexing that we had a result in 2007 that was so much worse than the “models” forecast and this does not appear to have had any consequences in the years that followed. The 2007 ice “melt” was not melting from abnormally high temperatures but a wind event. The wind blew the fragmented ice out of the Acrtic sea into the warmer ocean waters where it melted. It also blew ice on top of ice so although the extent and area decreased the actual amount of ice did not decrease as much because you had two “ice cubes” stacked on top of one another. At least that is my understanding of the 200y ice “melt” event. Thank you so much for your return comment. From what I read from the link you gave I think that is exactly what I have been searching for on and off for months. I have experience in such type of projections, conical tangent at 70º N while to a standard ellipsoid, parameter given in the documentation. It also seems to pass through NSIDC brightness to concentration algorithms which is what I was after (don’t want to attempt to write that of course, shudder!). When they say near-real-time as 3 to 6 month files, are those files then updated daily to today or yesterday? That was the only aspect not explicitly explained. Oh Julienne, that last statement on the ASCII file, I realize there are some touchy points of exactly where the center is and whether the concentration is includes in it or a neighboring cell, and such. The cells from the two projections of course also would not align. I wasn’t asking to that kind of depth, just generally. I think this calls for a “Celebrity Ice Stunt” by the WUWT crew. First, you hotdog over an ice covered landscape with a tricked out Hummer dragging a giant rubber duck. (Or floatie Polar Bear) Your mission: to find open water for your tailgate party. Alas, finding none, you deploy a crane with a giant auger to cut a hole in the ice. Down 10 feet, you don’t find any water, only the frozen abandoned (color coordinated) fuel barrels from the Catlin expedition. Then the beer girls jump out and a bonfire appears, and everybody parties. The camera pans away to a scene of eternal white. So long as PIPS has been equally “conservative” then it is useful. Only if the measurement method and attribution is changed can the data be suspect. (In the end all the data we get on the ice is relative, because all of it is obtained via indirect means. It’s not like any of them take direct physical readings. The people running PIPS have no dog in the AGW fight. Their interest is elsewhere, obviously. Data unbiased by models or assumptions of what will happen are pretty rare in this field, and should be treasured. Not bagged just because you don’t like the result. A couple of days ago, I had come to the conclusion that your arguments and evidence have been more persuasive than those of Gates. But now that you are congratulating yourself, I would caution you — Pride goes before the fall! As you stated in previous posts, weather (winds) can turn on you. Concerning DMI’s temperatures, from June 10 to date, they have followed 2007’s track quite closely, so I doubt you should take comfort in those. Again, I commend you for your bravery in projecting early that 2010’s minimum would be close to 2007’s. However, I do object to your inference that the 1980 to 2000 level is normal. That is like looking at the MLB standings on April 15, noting that the Toronto Blue Jays lead the American League East, and declaring that leadership be normal. And your posts definitely made it a contest, so your protests otherwise seem disingenuous. Nevertheless, your declaration that you will be around in September speaks well of your integrity. And who knows? — the weather could turn toward your favor! Looking at the Hathaway prediction graph, the peak of the last cycle was mid 2000, meaning that there was a lag of at least 7 years to the minimum ice extent. Given that the bottom of the last cycle was mid last year, I’d suggest that you are underestimating the lag time between solar cycle and ice extent changes. Interestingly, since we have only had accurate ice extent data since 1979, we can’t even really say if the lag could be longer than the length of a single cycle. Personally I don’t think Arctic ice extent is a very good indicator of anything much. During the last ice age polar ice reached down to much lower latitudes, and the sheer volume of ice was huge. Since then there has been a general trend of ice loss. At a constant temperature the rate of ice melt varies in relation to surface area to volume ratio, which means that melt speed increases the closer you get to zero ice (without any temperature change). You could argue that accelerating ice extent loss is the default, and any slowing or plateauing is a sign of temperature drop. You’ll probably want to hold your nose while you read his self promotions. He’s a P.T. Barnum of the 21st century. “The 2007 ice “melt” was not melting from abnormally high temperatures but a wind event. The wind blew the fragmented ice out of the Acrtic sea into the warmer ocean waters where it melted. It also blew ice on top of ice so although the extent and area decreased the actual amount of ice did not decrease as much because you had two “ice cubes” stacked on top of one another. However, it does not alter the fact the 2007 result left the Artic Ice pack in a far more vulnerable and unstable condition than it had been previously. A lot of multi-year ice was lost. In this context the increases in 2008 and 2009 take on a far greater degree of significance to me. It would be unreasonable to have expected a quick return to 2006 levels given how much ice was lost in 2007. 2006 began with a much greater amount of stable multi year ice than 2008 or 2009. Should we see an extent this year that is close to or exceeds the 2006 minimum, to me that will be a significant result. It is worth noting, btw that 2003, 2004 and 2005 all had slow early season melts but greater late season melts than 2006 to 2009. It does appear that when ice loss is high in the period before July that it will be much slower later in the season. I believe this is what we will see this year. ‘Vulnerable’ and ‘unstable’ are subjective opinions without any empirical validation. First, show us that the current conditions are anything out of the ordinary over the past ten millennia of the Holocene. Extrapolating your assumptions based on a 1979 – 2010 time frame is not science, because it does not follow the scientific method; it is not testable. It is simply alarmism that we can do without. Show us that what is occurring is anything but natural regional variation, and I for one will sit up straight and pay attention. Most of the loss of multi-year ice in 2007 occurred during the winter, not the summer. It had nothing to do with warm air temperatures. I am looking at much more than air temperatures for my analysis. Spain won Wimbledon, today’s leg of the Tour, and is about to win the World Cup. Pretty spectacular performance for one relatively small country. Yeah yeah. Wait till next year! I’m rooting for the Dutch, it’s the underdog thing. Hey wait a minute, maybe that’s why I’m a skeptic? Hmm Holy Great Insights Batman! Keep up the good work (you and all commenters). Your posts are informative and fun. One of the few sites where you can read BOTH sides without the typical labels flying around. This site also avoids the other common configuration of the “dogpile”, where the regulars tee up and jump on the “one other guy” they let post. Gates, of course it’s a contest. Ever read biographies on scientists? Then there is the competition that went on to be the first to photograph stars during an eclipse of the sun to find proof of Einstein’s General Relativity. It was nail biting for those involved. Sleepless nights staring at the photos. And there was dread of being the one wrong. Climate models must work both directions; past and future. According to the following hindcast graph, arctic sea ice volume increased from approximately 38 km2 in 1955 to 48 km2 in 1967. This sea ice thickening was associated with a strong negative NAO index. Natural forcing clearly overwhelmed co2 forcing. The last thirty years of sea ice decline have been associated with a strong positive NAO anomaly. This anomaly is not natural? What about the extremely long lived positive NAO anomaly from 1910 to 1930. was this natural or co2 forced. Do you think it is possible that the arctic sea ice volume then could have been less than today? Most of the loss of multi-year ice in 2007 occurred during the winter, not the summer. And that’s exactly why your purported PIPS 2.0 analysis can’t be relied upon for much of anything at all. When doing relative year over year comparisons (essentially ratios) the units make no difference. Ratios are dimensionless, like your comments. Holland plays a similar style to Germany, and Germany didn’t get a clean shot off the entire game today. Sorry but I think you misunderstood my post. It was certainly in no way intended to be alarmist. My assertion is that in any given year multi-year ice iwll be less vulnerable than 1st year ice. Would you disagree with this as a general principle? 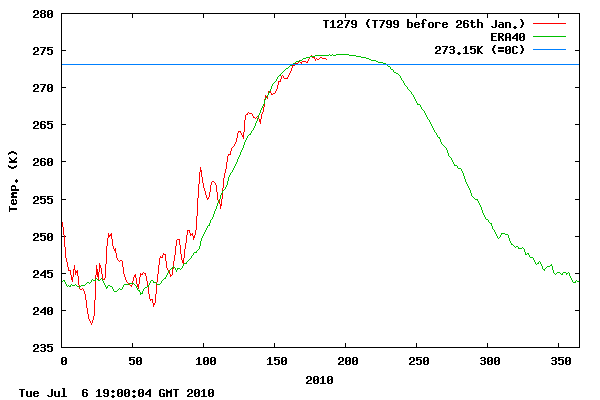 My belief, is that their is an equilibrium that Artic Ice will return to in the shorter term and that 2007 took us well below this equilibrium. If alarmist predictions are to be believed this should have accelerated the downwards trend which it failed to do. Whilst I have agreed with much of what you posted I’m not sure I agree with this. 2007. The end result in 2007 was to some extent pre-determined by the years that preceded it. Would we have had the extent of ice loss that we saw in 2007, if those same localised conditions occurred 20 years earlier. I tend to believe not. Coming into 2007, we had already lost a lot of multi-year ice in previous seasons. Unless your saying that multi-year ice reacts/behaves the same way as first year ice then I can’t agree with you. Bottom line is I am not alarmist. I think this years Artic Sea ice minimum will to some extent be influenced by the results of recent years. It is unlikely to get over 6 million sq km due to the 2007 loss but the trend is showing some improvement so it is likely to be better than 2009 and possibly even 2006. BTW the data is now out for 7th July 2010 at 45,000 sq km with July 6th re-adjusted to 33,750 sq km. The average for the previous week is now 63,995 sq km. Looks very much like a slow down of ice loss to me. We are now only 115,156 sq km over the 2007 result but more importantly only 211,093 sq km under the 2006 extent at 6th July. The 2006 minimum was 5,718,719 sq km. Are we headed for a repeat of 2006 or 2007. My money would be on 2006 due to the level of ice loss earlier in the season. 2007 didnt lose ice til much later in the season and as Stephen pointed out it was due to specific reasons not aligned with temps. Incidentally. When one begins looking for “recovery” of Arctic Ice extent, in the end its going to come down to an increase in the level of multi-year ice. This will logically first be seen in the Arctic Basin later in the season and so for the time being early season ice loss which is predominantly first year ice is going to be of less significant. It is what will occur in the Arctic basin beyond mid-July that is more likely to point towards a long term trend. It was an erronous claim in my opinion, not only that but it was spun to indicate a trend. Like I said silly little thing to post. I am very firmly in the steven goddard cheering section, but I would be sad to see R.Gates, Julienne, villabolo or Junior run off this blog through ungracious sniping. NSIDC maps showed much less multi-year ice in Spring, 2008 than they did in Autumn, 2007. Wayne, it sounds like you downloaded the Had1SST data set? You should probably be aware that prior to about 1953, most of the sea ice data is based on climatologies since there is very little observational data spanning the entire Arctic. Of course data from 1979 onwards is the most reliable since the same type of sensor/method (multichannel passive microwave of similar frequencies) is used. Data from 1953-1978 relies on ship observations, aircraft observations and some earlier satellite missions, including ESMR which was a 1-channel microwave sensor. The Had1SST data is on a climate model grid (lat/lon grid) at a different spatial resolution (and grid) than the data I directed you to. I’ve only actually looked at the derived ice extent from the Had1SST product so I’m not familiar with the data format, but I’m a bit surprised it would be in ASCII format. You will want to keep in mind that the Had1SST data are at a coarser spatial resolution than the data I pointed you to when doing your analysis. The near-real-time data currently contains data from 2008 onwards. Near-real-time (NRT) data is kept until the better calibrated/geolocated data from RSS comes in and then the “final” product is produced. You can link to NRT, final, and preliminary data products via the ftp site. They are all in the same grid (and hopefully the same format, but the final products should have a 300 byte header which I don’t think is the case for the NRT data). If you have any questions on how to read/work with the data, contact user services at NSIDC. They tend to be very helpful. As long as this years minimum ice extent again exceeds the prior year (2009) people can rightly claim that the minimum arctic ice extent is recovering. 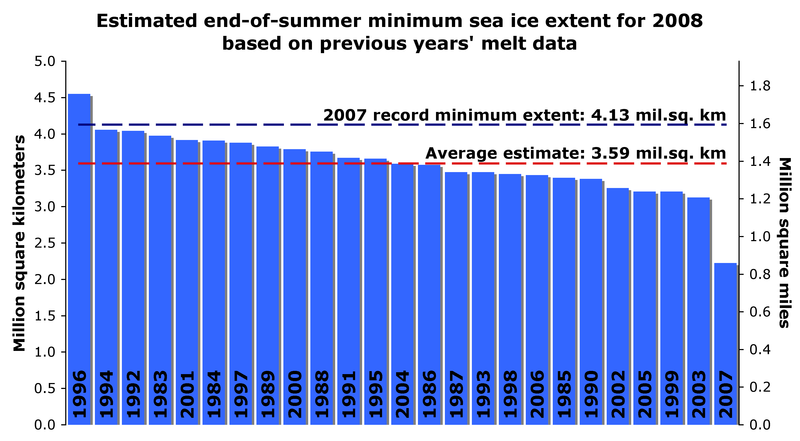 The low point for minimum ice extent was in 2007 and it has been in recovery in 2008 and 2009. Obviously the long term trend is still down and we will need to see a number of years of 6 million sq km + before you could say that the long term trend has changed with statistical confidence, but each season that exhibits year on year growth in ice extent is defineitely a recovery in ice extent from the years prior. Apologies if you find it abrasive Steve, meant more as advice. Also, some of your comments to posters are not always the most gentlemanly are they? Anyhow, as I mentioned above, the temps don’t seem low enough to cause freezing as I assume they are formed in ice formed from seawater so to freeze they must get down to about -2C or so, and the temps linked above by another poster showed -0.3C. What happened is that, like they did a few days ago, they got full of snow or sleet or a mixture of both and that has now melted. As R Gates said, it’s just a weather related short term thing and didn’t belong in this otherwise excellent article. Also, the comment written “Meltwater ponds at the North Pole are starting to freeze over.” is trying to suggest something that it shouldn’t because it is not happening. The top layers of the ice are freshwater, from snow and natural desalinization of sea ice over time. Just a final thanks for your help. I’ve already have the Had1SST (now I know what to call that dataset) running, and yes, its ~gig of glorious ascii, any mean month from 1870 to Oct. 2008 and at least six times the size required 🙂 And, I noticed all of the caveats on that data. Don’t think I will have any problem with the rest, this is very similar to my specialty in programming over the decades. If I’m going to take the time to program and analyze this data for the coming years I want to do it right. Thanks again, you got me off high center. The Arctic Roos version is also showing a right turn like you showed (but less dramatic) (http://arctic-roos.org/observations/satellite-data/sea-ice/observation_images/ssmi1_ice_area.png) . 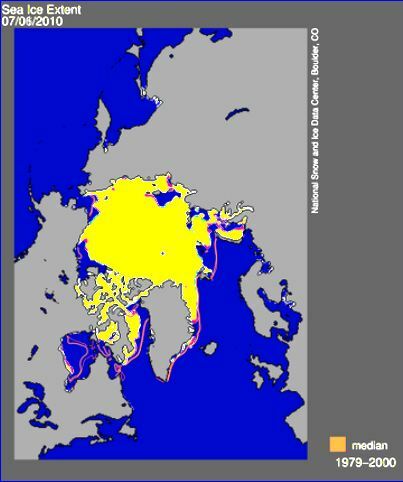 Yet NSIDC isn’t (http://nsidc.org/data/seaice_index/images/daily_images/N_stddev_timeseries.png) Any thoughts? Of course this octopus is not psychic, it must merely have extraordinary abilities to process vast amounts of data related to the playing of previous games and those involved in such to arrive at a forecast. With nine brains available it clearly has the processing power to “run” a model in its own… well, head or whatever is housing all those brains. I hope it’s not too focused on soccer (football), it would be interesting to show it lots of Arctic sea ice graphs and charts and have it make an extent minimum prediction. Ah heck, if we can provide it a better way of communicating with us, maybe a Stephen Hawking-type keypad, it could contribute to the next IPCC assesment report. Paul’s unwavering accuracy this year has even seen him become a target for furious Argentinian fans, who blamed him for their side’s quarter final defeat against Germany and threatened to eat him. People want to eat that octopus? After it has been demonstratively shown octopuses are likely more intelligent than humans? It is obvious that the WWF must immediately take action to protect these noble beings, since it is their sworn mission to protect all creatures from the unending ravages of evil mankind (except of course mankind itself since they are the violent aggressors). While they have decided their primary battle is against global climate change, since global climate change is a clear and present danger to octopuses worldwide they are already fighting for them thus this would be a mere extension of those ongoing efforts to save all life on Mother Earth (except humans). I expect the protests outside sushi bars worldwide to commence shortly. The melt is from below. This year will likely be the first year when all the 3-yr old and older ice is gone. Here in Australia we are having a great many climate change stories all seeking to ensure we accept the man made version. Some “facts” reported in the Land newspaper. NASA says the last 12 months were the warmest on record globally. NOAA says the combined global land and ocean surface temp was the warmest on record for May, March-May and January-May. 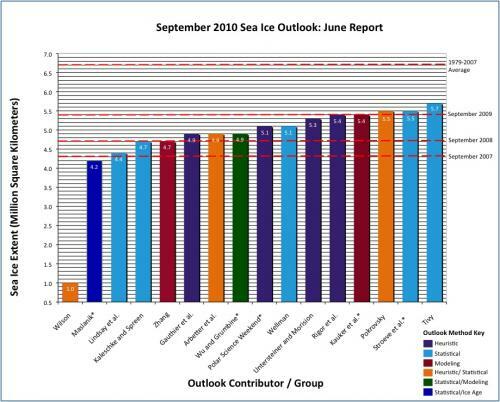 Artic sea ice is currently at its lowest recorded extent for June (USNSICDC). Some of these claims seem specious and I would appreciate any help to answer them in a letter to the editor. I appreciate there are some specialists here who know far more than I. Thanks. I can guarantee that BoM will get the answer it wants if the station adjustments we’ve seen so far are a guide. You might want to learn a little bit about the Arctic before posting. NSIDC explained in their April 7, 2008 sea ice news why there was so little multi-year ice at the end of the winter. Your last post made it quite clear that you really have no idea what you are talking about. Anomalous winds in winter can also flush thicker, older ice out of the Arctic, leaving the Arctic with a greater coverage of first-year ice. As noted by our colleague Ignatius Rigor of the University of Washington at Seattle, this winter saw a return of the Arctic Oscillation to its positive mode, an atmospheric pattern especially effective in flushing out thick, old ice. Why is the AMSR-E sea ice extent graphic in the post different from the one you see at WUWT website? Both 2007 and 2010 curves are markedly different. The claim of record low ice volume is from PIOMAS, which appears to be nonsense. The real story with global temperatures is that they have risen much slower than IPCC and Hansen forecasts. 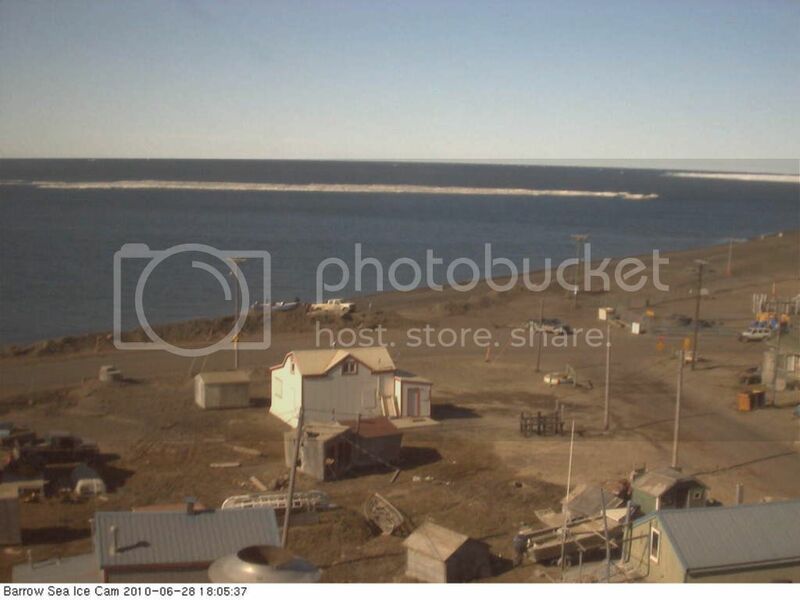 Melt ponds are freezing over at the other North Pole webcam as well. You are confusing area with extent. you keep saying that 2010 will be close to 2006, but at the same time “predict” a september extent of 5.5 km2. I suppose you’re not mentioning the minimum, here, are you? And to what database shall we compare this number? If we look at the JAXA extent chart, 5.5 looks much more like 2009 or 2008 than 2006. BTW, how do you react to the NSIDC claim that PIPS is a very bad indicator of sea ice thickness, and that it should not be used for year-to-year comparisons nor predictions? Another good post Steven, thank you. Reading Romm’s site, it is easy to believe that Octopus are more intelligent than humans. If I consider the ice area maximum, it has been shifted approximately one month later. Is it possible that the same phenomena will be seen for ice area minimum? -The wind compresses the ice during the winter, leading to increased concentration and thickness of the core ice pack. -The open water at the edges refreezes but this ice is of marginal thickness and concentration. -The ice at the edges melts more quickly in the spring leading to a higher melt rate. -The melt rate slows significantly when the thicker more concentrated core becomes the edge of the ice pack. Seems to make sense and, of course, summer weather can have its own influence that may increase or decrease the importance of this scenario. I think that discussion was much more about the slope of the melt in the key July-August period, and is muchly an observation of the (predicted) power of more multi-year ice (more than 2008-2009) to have that slope be more flat in that period. I suppose re extent you can make an arguement re 2009 vs 2006. If Steve’s number hits, so far as I can see the result would be almost exactly equidistant between 2006 and 2009. But 2008, as you suggest? No, not at all like it (if Steve turns out right, of course). Neither as to slope in July/August, nor as to extent. 2008 bottomed at 4.7M, so it would be 800K lower than Steve’s 5.5M, while 2006 would be but 300K higher. And the JAXA plots clearly show serious sag in the 2008 July/August slope as a result of the loss of multi-year ice in 2007. 2009 shows much less of that sag, but it is still there. Look at JAXA and compare 2006/2009 at ~Aug 5th vs 2006/2009 at ~Sep 10th. That’s what the relative difference in multi-year ice can do during approach to minimum. 2010, should the wind Gods cooperate, should show even less sag than 2009 in that period, as there is more multi-year ice avaialable. Hmm, I wrote a longer post and it disappeared. Perhaps it will return later. Take a look at JAXA for 2006 vs 2009, at August 5th and September 10th. What do you see? What caused it? What are its implications for 2010? Showman, indeed, with big brass ones, which I’d bet still haven’t dropped back since that swim in May. 2010 has come, but not yet gone. It may still have some surprises for all of us. The minimum is controlled directly and indirectly by elevation of the sun, and there isn’t much opportunity for it to shift earlier or later. 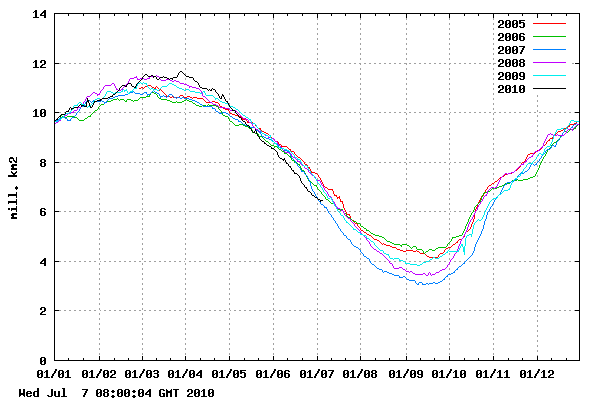 The shape and behavior is tracking 2006, but 2010 has less ice than 2006. i.e. it is offset downwards. Thanks for another good update, Steven. I wonder how much the reduction in solar high energy UV will affect the summer minimum? It’s been fun following this slow motion horse race for the past couple of months and I appreciate the comments that help us to understand the various issues involved. I’ve got a two questions and an observation. 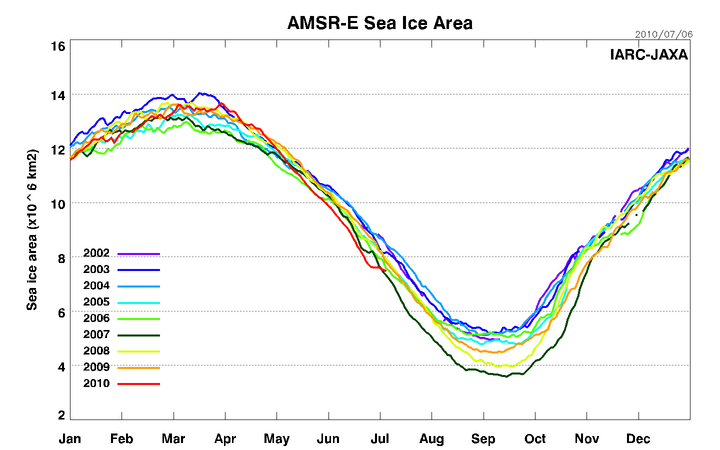 The first question: Why does the AMSRE Sea Ice Extent graph start in 2002? (I’m assuming a new satellite began taking pix, but am not sure.) The second question: How certain is it that there is not a discontinuity between 1979-2001 data and 2002-2010 AMSRE data? That is, are those two data sets reliably comparable? The observation: Each year since 2002 the rapid melt season typically ends with an inflection point where the melt rate drops to a lower level that is generally sustained without reversion to the earlier higher melt rate. That inflection point occurred in 2006 starting about July 10th. This year, assuming the rather sudden drop off of the melt rate turns out to be the inflection point (I know, big if, but it’s gone on for 8 days already) then it will have occurred about 10 days earlier than 2006. This leads me to wonder if the minimum extent might exceed the 2006 figure and possibly even the 2004 figure and come in in the low 6mm’s. Any thoughts on whether this is at all likely? When the Hudson Bay and other areas outside of the Arctic Basin melt out, the slope drops off. This year they melted earlier than in previous years. I don’t think it provides much, if any, useful information about the summer minimum. I don’t care if the PIPS thickness numbers are absolutely correct. I am only using PIPS for relative comparisons, so as long as their methodology is fixed from year to year PIPS should do the job just fine. So far, it seems to be spot on. For your own good, you really shouldn’t do that. I don’t care how much “excess” the doctors will say you have right now, you may well need those brain cells later on. An observation that I’m surprised no one else seems to have made (I could, of course, have missed it through not thoroughly reading all the comments thus far) – in the AMSR-E Sea Ice Area Chart Steven reproduced, there was a flattening in the 2007 curve in late June before it began declining precipitously. In fact, there even appears to have been a brief uptick. I don’t pretend to know how fast the melt is going to go through the rest of July and June but it clearly wouldn’t be unprecedented for the 2010 decline, having slowed down this last week, to speed up again. So.. Big thick plate of unmeltable ice in the artic, generally cold expansion wind-front and decreased global temps at high latitudes. So are you forecasting a rapid drop in ice area? I certainly appreciate Steve’s skill in calling this short-term “turn”, but like the much bally-hooed March “bump” up, or his mentioning of the melt-ponds icing over (short term weather) I don’t see this turn lasting. I think the 2010 trend will make a final turn back down, paralleling 2010 down to the last days of August at least. No, I’m not forecasting a rapid drop in ice area. At the risk of being alleged to have an abrasive communications style, which part of “I don’t pretend to know how fast the melt is going to go through the rest of July and June…” (“June” being a case of insufficient editing on my part – I meant ‘August”) wasn’t clear enough to tell you I wasn’t making a prediction, only observing that people might be reading too much into a very short term trend? The Arctic Basin area (not extent) map you linked is probably just reflecting problems with the sensors differentiating between surface meltwater and seawater. At the risk of repeating everything I have written in the last few months, I will point out that my analysis has very little to do with the extent/area graphs. It’s also controlled by how much ice there is to start with, (plus clouds, currents, air temperature, plankton, etc.). Since the maximum was a month later than typical, it’s not a great stretch to hypothesize that the minimum will also be later by some amount. But not as much. I think you misunderstood my question. The NSIDC precisely states that PIPS thickness should NOT be used to make comparisons between years. And this is exactly what you are doing. So could you tell us why, and how, you believe that the point of view of the NSIDC that PIOMAS is much more relevant is not correct? First, thanks for the correction, I should’ve checked my math for reasonability and looked at their graph again; 25 million cubic Km would be 15% of the Earth’s total volume. Obviously off by a factor of several orders. Second; the point stands (with corrected math); beginning of June we had roughly 25,000 km^3 of arctic sea ice, vs. their average of about 25,000 km^3 of arctic sea ice. Am I wrong on that? Again, thanks for the correction on where the decimal point goes! The 2007 “uptick” you mention doesn’t show in this post, above. The Nansen Sea Ice Area chart doesn’t show your 2007 uptick, either. Different filters? I guess it depends on whose chart you look at. But the mechanisms acting in 2007 and 2010 are so different (so far), I don’t think you can compare them in any meaningful way. No mention of multi-year ice melting in WINTER (12/21/2007 to 3/21/2008). Not a single word! Your cherry picked quots tells us that sea ice moves around. Like there are wind, waves, and currents. D’oh! Go figure. Not exactly newsworthy. “Sea ice moves around because there are always winds, waves, and currents.” You heard it here first folks, Steven Goddard confirms the all too obvious. So you see Steven Goddard, you clearly don’t know what you are talking about. Did I claim my observation utterly destroyed your analysis? Your writings aren’t the only ones here for me to respond to. That said, if you think the ice area graph is so unimportant, perhaps you shouldn’t write things about it like “The decline in the slope of the area graph is even more dramatic. Area is a better indicator of melt, because it is not affected as much by wind shifting the ice around.”. People might justifiably think you believe sea ice area graphs matter. I found the AGW Artic Anthem Song! Forgive me but I’d rather believe my eyes than you. There clearly was a point late in June at which the slope of the 2007 line briefly turned positive in the chart Steven posted at http://climateinsiders.files.wordpress.com/2010/07/amsre_sea_ice_area.png, the fourth image in this post. I’d be very surprised if that was an absolutely accurate reflection of physical reality but it’s clear to see in the graph. That doesn’t seem intuitive to me. I would assume (perhaps incorrectly) that those areas would typically melt out in roughly the same sequence, if not the same time of each summer. If so, the inflection point on each year’s graph would come at about the same level of extent, but the inflection points vary significantly in terms of the extent level at the time they occur. In 2007, for example, the extent was down around 6mm before the rate of melt started to decline much at all. Wouldn’t the Hudson Bay and other areas outside the Arctic basin have melted long before that? It well be interesting to see if this is indeed an inflection point and the melt rate continues well below 100k per day for the rest of the melt, or if it’s not and we return to the approximately 100k melt per day typical of the fast melt periods as Gates is now suggesting. I think there is a typo in your sentence, do you mean that the 2010 trend will parallel 2007? If you were right, the maximum should occur at the same time. But this year something must have happened. And it is not controlled by elevation of the sun. I mean a change of sea currents. Don’t let the door hit you in the rear on the way out. But Veli Kallio (an ice “expert”) was quoted on Climate Sanity as saying ALL arctic ice will be gone by August 8th ! Note the robust trend line extrapolation ! NSIDC says all kinds of things. Mark Serreze predicted an ice free north pole in 2008. Some of their information is more useful than others. What I aid was that the minimum is controlled by the elevation of the sun, not the maximum. No problem. The problem I think with your number is that your average thickness is way too high, the area was about right. I have confirmed you must not be able to Google since I already told you how to find that info back at the “Ice Dancing” article using Google, way back on June 26, and you responded so I know you read it. I have confirmed Steve already told you he zooms the ROI before counting, back at the “Ice Dancing” article. I have confirmed that, given your track record, it may help if you provide your evidence for such statements, but given the usual quality of your evidence it may not help at all. But at least if you show your work there may be less people who think you’re a troll just throwing out false accusations. Two things. Gates, you bring up an interesting point that really needs some gold standard research to back up your point. Describe how an increase in CO2 has led to a more frequent DA, and please site references. And let’s be clearer about increasing CO2. Report its actual ppm change so that we can remember our sense of proportion. The “30% increase” is a data rich information poor statistic. You might also want to report all the rest of the increased gasses and water vapor while you’re at it. I believe we were discussing, a few months ago, an article that clearly suggested that while CO2 has gone up, so have all the rest, so that the increase in CO2 compared to the other components of our atmosphere has been nil. Are you sure it’s just CO2 that has caused what you say is a change in the DA? Explain how all the other possible causes are not it. But you could be right and we could have faulty sensors, or errors, but it seems to make sense that the higher temps and early melt in the Barents would spill over into the Atlantic side of Arctic Basin with all that open water. I shall do this gladly, but am off to an evening event, and shall post this later. What you believe happened and what actually happened are two entirely different things. You have, as of right now, not provided a shread of quantitative to support your specious claim. I stand corrected on your first point, the original ROI. On the second point, “zooms in” is qualitative NOT quantitative, thus there is no way to convert from SG pixel-metres to actual engineering units (km^3). Why do you suppose that is so? I have reverse engineered the PIPS 2.0 map projection and know that a PIPS 2.0 pixel is ~1130 km^2. I have also reverse engineered most of SG area/thickness/volume plots from earlier installments. The conversion from PIPS 2.0 pixels to km^2 is very easy and straight forward, yet SG refuses to do so, as this would let one compare his ice volume data directly against the PIOMAS ice volume data (which I have also reverse engineered, as these are allready in engineering units (KM^3). So there is a direct and all too obvious reason SG refuses to present volume data in engineering units, although this is very easy to do. Another reason the PIPS 2.0 data is not quantatative is that PIPS 2.0 is meant for navigation purposes only, this means that there is a factor of safety (FS) included in the thickness estimates, typical minimum FS is usually 5/3, so what this means is, that even doing relative comparisions the deltas are amplified by 5/3 also. I’ve been directly involved with half a dozen military projects over my professional career (two of which were 6.2 monies). I had a certain security clearance level. I can walk in today and access the *.mil domain, because that’s where I spent my entire professional career. Scientists’ access to the polar regions depends on an over-the-hill and increasingly fragile U.S. icebreaking fleet. A 2006 report from the National Academies called for building two new icebreakers, but Congress has so far been unwilling to pony up the estimated $2 billion or more that would be needed to upgrade the fleet. And the latest breakdown has scientists worried about the fate of future research cruises. So now you know; without those icebreakers up there in the arctic; the ice wouldn’t be breaking up fastr enough for some of these ice scientists to get any work done. I would think they would be the first to call for the removal of ALL icebreakers from the arctic; to prevent that from contributing to man made global warming; by the way; what the heck is CAGW ? Acronyms are supposed to have three letters; not four, so why is that C in there ? I just noticed the bill for their toys; can you believe it they want a billion dollars a pop for their toys. Can you believe the first prototype Spitfire was built for about $5000 or maybe that was pounds Sterling; back when Pounds were Sterling. Send the Catlin expedition up their with their core borer; and they can break up the ice for you. Yes. I’ll still be interested to see the shape of the 2010 July/August “sag”, as one of the points I’m interested in, and I think this multi-year 2007-201x period should be illustrative of, is “when is it reasonable to call multi-year ice effect on July/August sag ‘mature’?” 3rd year ice? 4th? What? Clearly 2009 was not quite there yet on that point, tho much better than 2008. Will 2010 complete that, or still show a little more sag than 2006, but not so much as 2009? But pixels closer to the pole will represent a larger area than those further south on that map projection. Do you talk about your security clearance in the past tense because it was revoked due to you wasting everybody’s time? Actually, Aug/Sep “sag” would be more accurate for what I’m pointing at, looking at JAXA. The reason I’ve been pointing at July 1-15 since about the middle of April was a different point –as a pretty reliable indicator of whether another 2007 was potentially in the cards this year, as some were predicting. So far the answer seems a pretty credible ‘no’. Good point. The maps are probably intended to be something close to equal area projections, but there are other reasons not to convert to standard units of volume. Trying to determine absolute volume numbers would give wrong results, and serves no purpose- since I am only using PIPS for relative comparisons between one year and the next. Sitting in my chair, I am travelling hundreds of thousands of miles an hour – but it makes no difference to me because I am only concerned with my relative velocity to the objects around me. 1) Yes it’s not an equal area projection. However, it’s an easy projection to figure out, on my first try even, the difference between N70 and N90 is only a few percent (+/- 3%) if one assumes equal area vs actual transformation, certainly good enough for engineering purposes, and definitely good enough for SG. 2) I’m retired, I’ve done about four years of consultion with the USACE since retirement, but none of that required my past security clearance, which went away once I retired. Yes you would get wrong results. 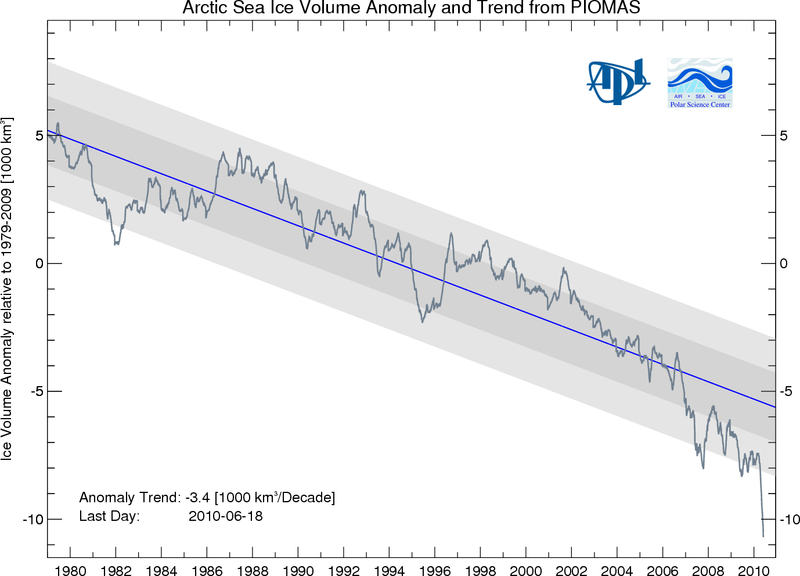 As other commentators have pointed out PIPS have published ice volume data for several years. You could validate your calculations. Your refusal to do so speaks volumes. 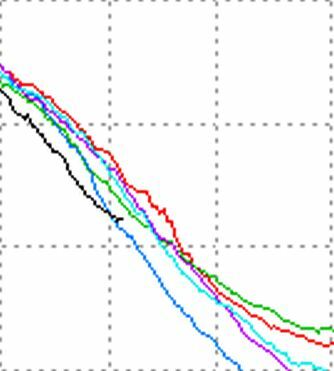 Well the, 15 day moving average for daily ice loss continues “dropping like a rock” (as Anu would put it. The average daily ice loss for the past 15 days now stands at 75,906 sq km per day. Here are the averages for the past 8 years for the period 24th June to 9th July (past 15 days). You have to go back to 2003 and 2004 to find a lower rate of ice loss for the corresponding period. Comparisons to 2003 and 2004 should also take into account that both those years saw much lower levels of ice loss early in the season. So any assumption that we might see higher ice loss later in the season as we did in 2003 and 2004 do not necessarily hold. Given the early season loss this year I remain confident that the rate of ice loss this season has already peaked and we are headed for a minimum extent similar or greater in extent than 2006. When you return: Please show, by calculations of heat transfer and delta T through the calender year, exactly how a global change of less than 1/2 of one degree is directly responsible for the steady loss of ice between 1979 and July 2010. Further, you must show that that ice loss occurred only during the supposed winter heat rise – because Arctic summer temperatures have remained steady at +3.0 degrees since 1958. Ice extent loss is, after all, the ONLY proof of global warming we (you actually) have left – after 15 years of steady temperature since 1995 – and so you must be able to show exactly how the loss of ice area has happened based on the specific temperature rise you claim to have measured. Do not extrapolate temperatures before 1960 or after 2010. You are claiming a steady ice loss because of a supposed global temperature change. Global temperatures did rise during that period. I am claiming your calculations cannot produce that result based on the net 4/10 of one degree change actually measured. Ought to be enough to convince some skeptics at least that there are some significant changes (i.e. warming) going on in the Arctic. True enough, this could be natural variation, cycles, etc., but none are known to exist that could have such a dramatic effect on the Arctic. Is it just a coincidence that AGW models have long stated that we’d see the first effects in the Arctic, and now we are? Still, there could be some other explanation, but if the warming is not from CO2 increases (30% in the past three hundred years or so) then what is the source? 1) It will continue to strenghten, occurring even more frequently and become more intense, such that it will become the norm for the Arctic. All chaotic attractors appear virtually instantly and then grow rapidly. In the climate system, the DA’s arrival from a climatological perspective has been instantly. 3) Other chaotic attractors are “out there” waiting for new tipping points to be crossed. We’ve seen this throughout the history of the climate, and in a period that we are going through with geologically speaking rapid increases in CO2, we must expect other chaotic attractors are close by. I only know the basics of chaos theory, and I welcome the feedback from readers on WUWT who know it better than I do to give their thoughts, especially in the area of oscillating chaotic attractors and their growth and evolution. Steven Goddard is not mentioning Barrow any longer. his forecasting skills did not work that well on sea ice break-up. 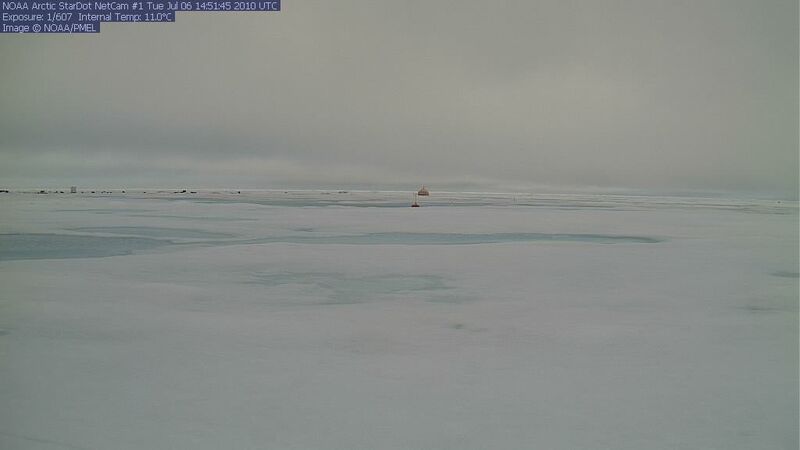 Steven has written a post, claiming that there was no change to land fast ice at barrow on the 26th of June. it turned out, that the ice was gone from Barrow the day BEFORE the post was written. he also made strong claims about the break-up on NARL near Barrow. Steven talked about the latests break-up on record and was still saying I expect that the ice will last longer than July 8. in comments on the 5th of July, even though the ice broke on the 4th. forecasts don t get more wrong than that. my blog is still there Anthony, nothing hidden at all. i am pretty proud, as you seem to be my only reader. i am fine with any discussion about the success of the surge. shall i write a post on my blog? “Weather conditions, atmospheric patterns, and cloud cover over the next month will play a major role in determining whether the 2010 sea ice decline tracks at a level similar to 2007, or more like 2006. Although ice extent was greater in June 2007 than June 2006, in July 2007 the ice loss rate accelerated. That fast decline led up to the record low ice extent of September 2007. Kind of mirrors to some extent what I’ve been saying. In 2006 when we lost a lot of ice early, the ice loss during the remainder of the year slowed significantly. This year mirrors 2006 to signficant degree except the early season loss was even earlier than the 2006 loss. As NSIDC have said then “Weather conditions, atmospheric patterns, and cloud cover over the next month will play a major role in determining whether the 2010 sea ice decline tracks at a level similar to 2007, or more like 2006”. Given the similarities between this year and the ice loss of 2006, my money is ice loss for the remainder of the year being similar or possibly even lower than the 2006 result. If this is the case the September minimum may approach 6 million sq km. Misleading, wrong, potentially libelous; you certainly made sure to get all of that in there. My, aren’t you special? In order to better visualize what is happening in the Arctic this summer, I generated an animation of satellite photos over the area of open water west of Barrow, AK. The landfast ice is not showing any changes. In my last post, we discussed how there has been no visible change in the landfast ice near Barrow, AK. during the last week. By the Barrow Break-up site as found in the “Observations 2010” section, it was reported a break-out occurred at Barrow on June 25. Steve covered it in “Barrow Update” on July 3. On June 25, using satellite images going to June 24, Steve made his “landfast ice” statement, while asking readers “What do you see?” and giving that statement as one of his observations. On June 26 he made reference to the statement in his previous post. On the Barrow site, actual date the observation was posted unknown, the break-out on June 25 was noted, which Steve noted with a post. You claim he made that statement on June 26. Thus you are wrong. 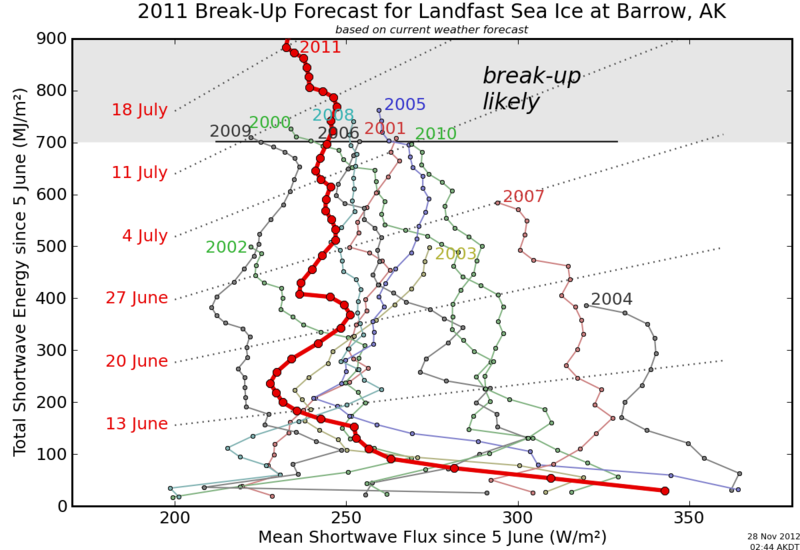 As those of us watching the Barrow site knew, and as I had noted at the end of the “Barrow Update” comments, on July 5 they had actually increased the prediction from July 7 to July 8, then later on July 5 the prediction changed to July 5, the same day, and in “Observations 2010” the break-up or break-out on July 4 was noted. Interestingly, I still can’t find on that site a confirmation that break-up has occurred. I would say I can’t see any change on the site since July 5, but the prediction graph was updated with July 7 being the last “actual measurement” with the 2010 line still not terminated. So, you’re here harping about comments made on July 5 about ice that was actually lost on July 4 despite the loss not being reported until July 5 after Steve made his comments. And technically it appears that the break-up has yet to be confirmed. Plus in you hideous comment above you are whining about Steve’s forecasting abilities when the experts of the Barrow site didn’t forecast the July 4th loss either. At the start of July 5 they were so confident the ice was going to stay around they even added a day to their prediction! So basically, Steve was as good a forecaster as the experts. So tell me, sod, did you actually read any of these articles and perhaps the comments here on WUWT, or did you just gulp down some obviously misleading and/or incorrect comments about them elsewhere then ran over here to regurgitate? If you had a shred of honor you would retract your statements, especially that egregious claim about the “landfast ice” statement. As it stands, I certainly know better than to wait for you to do so. i did not accuse Steven Mosher of being a fraud. Goes away for a year, then comes back to complain to all his many readers about something that happened on Lucia’s site, then goes away again. Truly something to be proud about. Before we get too far into a discussion about some kind of new dipole pattern setting up, please read the following. It will serve to place things in perspective. As far as mother nature is concerned, there just aren’t too many things new under the sun. Gates, so you know, my fall back argument will be based on real observations. Not models, and not chaos. But real hard in situ observations. The Arctic Dipole t’aint new and the Arctic melt off this past decade t’aint new. So the Arctic Dipole t’aint some kind of “new oscillating chaotic attractor caused by CO2”. Let’s start by discussing how a natural occurring dipole is created. If we can all understand the underlying and fairly well known cause of such an atmospheric condition, we can go on to discuss how external factors might be able, or not, to affect it. Today, July 9th, feels to me like a little microcosm of the frustration and fascination of trying to figure out Arctic ice trends. Look at JAXA –2006, 2007, and 2010 are basically right on top of each other today, more than three months into melt season. Still snowing and sleet but still a a huge melt water pond. The above author, Polyakov, regarding natural dipole variability, is well respected and has authored and co-authored many papers on global warming, some showing evidence, and some not. He seems willing to question consensus and is a staff member at IARC. Many thanks for the link, reading and taking on board, I usually get there, I just never know when. That would be interesting because I am sure a lot of readers, including myself, know little about it. Can you start the ball rolling by explaining how an atmospheric dipole is created Pamela and then give a list of how external factors could effect it, then R Gates can respond? Gates is the one that believes CO2 increases can affect the dipole. It will be up to him to explain how he thinks that happens. In the meantime, both the North Atlantic Oscillation and the Arctic Oscillation figure into the phenomenon called the Arctic Dipole. Read Polyakov’s article for starters. Then we can discuss what the dipole is, where it usually occurs, and how it contributes to melt when other oscillations are in sync with it. Utter rubbish, Steve had his fixation about the ‘record lateness’ of the breakout and couldn’t see beyond that. The ‘experts’ you talk about was a ‘bot’ projecting based on a projection of the cumulative shortwave since June 5th. When the data went down on the 5th losing the real data for about 20 days it erroneously increased its projection, when the real data was replaced the projection went to the 5th! On June 25, using satellite images going to June 24, Steve made his “landfast ice” statement, while asking readers “What do you see?” and giving that statement as one of his observations. On June 26 he made reference to the statement in his previous post. I told him he was wrong and the landfast ice was showing changes on June 25, 2010 at 11:04 am. Which resulted in the usual abuse from Steve (June 25, 2010 at 12:14 pm). On June 26, 2010 at 9:19 am I pointed out following his post “Latest Barrow Ice Breakup On Record?” that the fast ice was already breaking up at Barrow. The Barrow site was down over the weekend otherwise Steve’s errors would have become apparent right after he posted it. “Fortunately for Steve the Barrow site was down over the weekend otherwise his comments would have almost immediately contradicted since the fast ice at Barrow broke up over the weekend. As I mentioned just before the site went down it was showing ice free off the beach (25th at 19:22) with a boat in close to shore, in the fog the only ice visible is to the northeast. “The satellite photos which I already provided you from July 1-July 4 show no change in the ice. Of course he was unable (or unwilling) to give the date and time for those images, which in any case because of resolution and cloud didn’t show anything. He was clearly unable to interpret the basic information which was indicating that breakup at NARL had started. Unfortunately for Steve it had already broken up by then, and the evidence had been on the Barrow site for 24hrs. Steve was completely off on his predictions about the breakup at Barrow, which is no big deal except for his persistent refusal to accept contradictory data and to attack anyone who points out his errors. getting a forecast wrong, is not that bad. getting a forecast wrong, when the ice was gone already, was a little funny, but also not such a big thing. ignoring the evidence that was presented, was pretty bad. but the worst part is this: Steven was drawing wild conclusions about the arctic from the thickness of barrow ice, when that ice was no longer there! Here is a similar paper on atmospheric dipoles as they relate to global warming. Dipoles are naturally occurring atmospheric pressure generated gyre/cyclonic phenomenon that arise when adjoining oceanic SST temps are opposite one another. IE a warm pool is adjacent to a cool pool. The Arctic dipole sets up when the North Atlantic is warm and the North Pacific is cool. So far, when observations extend beyond 50 years, these dipoles, wherever they occur, appear unaffected by global warming and some models, depending on how they are constructed, mimic that result. Might it be that greenhouse gasses are unable to change sea surface temperatures (the cause of dipoles), as this science blog has reported all along? (just subtitute day & month e.g at the end 7 & 11 for 6 & 25). This may be the La Nina AIR patterns kicking in – – I think the earlier slow-down followed by no-motion was the End of the El Nino. R. Gates is quite perspicatious: the area between 90 & 120 degrees East (off Central Siberia) seems ready to dissappear right up to about 200 miles short of the Pole. Meanwhile that “swinging scythe” of heavy Ice has stalled more-or-less across the area warmed by the Open Lane in 2007. In 2007 a ridge of ice just East of that, kept the 40 degree (F) water away from the terminus of the Gulf Stream: this time the Warm current may be heading right into an area WARMER THAN IT IS, as much as 50 degrees (F) – – that would REVERSE IT, even if 75% of the Basin remains Ice-bound. … 300 mph winds is what I fear, & I had so hoped the Threat was shrinking. Instead it is just changing. … And … The Arctic’s Meteorologist’s idea of the La Nina leading to Clear Skies – – that could be a month away or, if Less – – it could hardly come at a WORSE time. Note that the possibly soon-to-disintegrate area – – is the part towards Europe, that is: the part covered with BLACK DIESEL SOOT FROM EUROPEAN DIESELS “forgiven” their Soot by the wacky argument that they reduce CO2 slightly – – when the soot is 1000s of times more dangerous & the USA has cut diesel soot 93% on engines built since 1995. Charles, take a breath. This is just cerebral discussions. But if you insist on panic, Charles, by all means, get a family burial plot, for the world will all end soon. Geesh. What do you normally do when you find you have not enough syrup for your pancakes??? Yeah, Charles, your medication is in the fridge, ok, open the door, there’s the pill box, ok, now take one, and some tap water, and just down it, o.k.? (well, IF the Ocean currents are similar enough to 10,000 years ago to do the same thing as then). They obviously feel the Recent Global Cooling (as the Global/Pacific 60-year Cycle turns over to its Cooling Half), means they have to ACTIVELY raise the Temp, to keep their $100 Billion a year in Tax -subsidies SCAM, called Kyoto. >> Suppress the Global Cooler, Sulfur. – – – -so the Right Wing will do nothing about it ? Because it’s like, against some Voodoo, inate, Instinct/Feeling … that there are never Any problems ? Who are you – – Neville Chamberlain ? For gosh sakes: look at the Pips charts over the last week. – – it fades more & more every day. July 9-10 __ – 135.157 ____ ? ? July10-11 __ – 106.750 ____ ? ? If anyone has another site that gives Numeric Data: please share. Not only does the DA create the atmospheric pressure conditions that create more warming in the Arctic, these meridonal winds that are associated with the DA flush larger amounts of ice out of the Arctic instead of cycling it back into the gyre. The increasing frequency of the DA is one of the most signifcant meteorological events in the Arctic over the past few years, and I think you’d find few Arctic weather and climate experts who’d disagree with this statement. To suggest that it the increasing frequency of the DA is “business as usual” for the Arctic is misleading at best. Bud, I have learned to shrug off a lot of abuse in my life. I’m a pretty easygoing fellow. But if you were standing in front of me pulling the same cr** you do to Steve all the time, I’d be really tempted to take a swing at you. Most likely I’d call security or the cops to get this raving lunatic out of my face before I give in and take you down. Don’t you know as an adult how to talk to other adults? Here you are whining because Steve doesn’t carefully examine every piece of “evidence” you throw at him and give you long thoughtful replies. You’re complaining he gives you short dismissive “whatever” replies, and I’m amazed he even bothers at all. Look what you just did in your post. You quoted Steve as saying: “The satellite photos which I already provided you from July 1-July 4 show no change in the ice.” Then you say: “Of course he was unable (or unwilling) to give the date and time for those images…” He just told you the dates, again, and you slandered him. You slander him, accuse him of hoaxes and lying, show him no respect, and still insist he should give thoughtful consideration to your histrionic rants. Wake up and smell the coffee, Phil-dot of website http://deleted/. And that ain’t no decaf either, sunshine. Yes I did, that is I think I did if I accept you don’t know the correct definition and usage of “deigned” and consider “deigned to chip” to actually mean “decided to chip in.” Otherwise what you said doesn’t make sense. One, my comment relayed what the researchers noted about that ice on June 14. As I said at that other post, “Thus about three weeks ago the ice was observed at that point to be of better quality than last year.” And it lasted until July 9, after the thing at NARL on July 4, and that chunk near Barrow giving way on June 25? That must have been some pretty good ice! Two, you can call up satellite images yet couldn’t verify for yourself that Steve’s satellite images were from July 1 to 4 just as he said? Stop right there. Steve thought the ice was good, I thought the ice was good. We both were going by the site data, Steve was also looking at the satellite imagery. Why did you feel the need to ascribe the motive “reassurance” to a simple agreeing? Phil-dot, I’ve actually looked at the July 4 archived webcam images, all 400+ of them, and on dial up it took a while to download the set. Eventually, yes, despite the fog, you do see lots of ice moving. But it moves left to right. Per the webcam site “The camera is looking approximately NNW.” So I’m looking at ice moving from roughly the south to the north. NARL is north of Barrow. 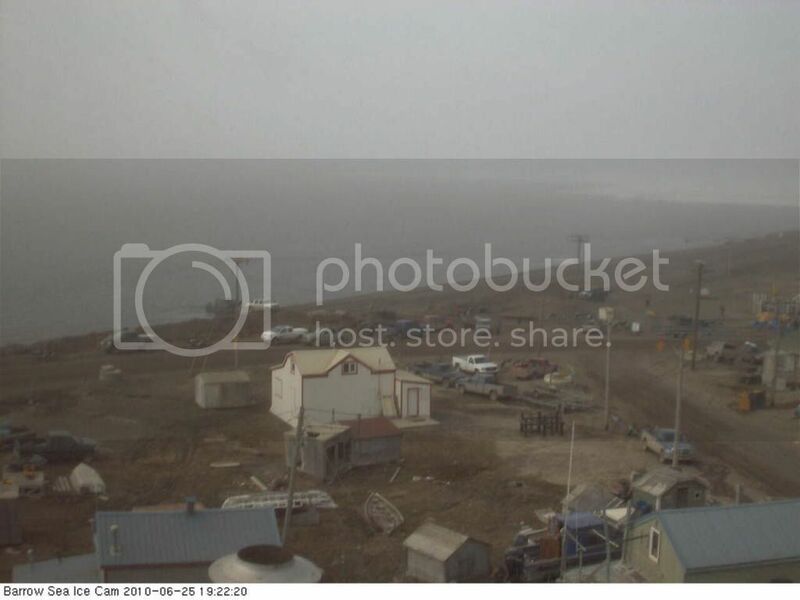 Thus far as I can tell, the webcam on July 4 is showing some ice had broken up south of Barrow and was moving northward, not that the ice at NARL had broken up. Thus to me what you cite as “evidence” is lacking.